Let us help you find the right answer! 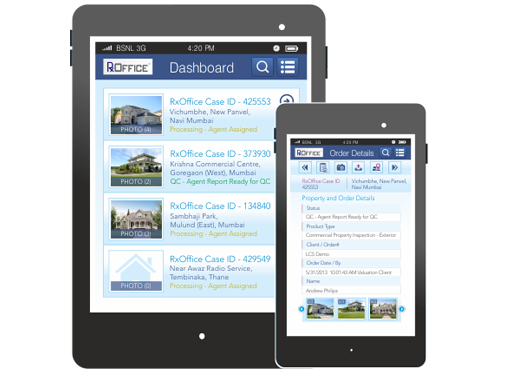 The RxOffice Valuation Mobile Application & Portal helps track the process of receiving and assigning both Commercial and Residential Valuations with a customizable workflow to fit to each organization.Valuation agent can view orders, capture photos of property, view map & direction, review & complete orders and a lot! It also provides web access to each participant in the process with access to only the data that is applicable to them, while also providing them access to current status and customized reporting to allow them to easily understand how their portfolio is performing. This application is easy to configure and allows for a streamlined process from beginning to end while providing transparency and accountability to each stakeholder involved. Agent/manager can see the list of properties assigned to him by manager/ newly added property into portal for verification, user can sort dashboard based on his own filter and they can save this filter. Dashboard shows the address of property and current status of valuation. User can see the property details by selecting the specific property and property details have image gallery for property. User can click new photo of property by using camera and upload that image against the property. User can upload the photos from gallery or while clicking photo app will show the upload option to new photo and app upload all these images into Valuation Portal. User can see the property location through the map and map will show the distance of property from users’ current location. App have facility to collect the user GEO co-ordinates while clicking the property image and send those details to portal, this features will help manager to cross check that Agent really visited to property location or not. User can view the particular photos details and can modify the photos details through app.User can use CAMERA, UPLOAD and MAP features from photos details also.